Your MacBook Air was made to be lightweight and incredibly thin, so we made our hard shell MacBook Air cases to match. Made of durable polycarbonate, this sleek, super-thin MacBook Air case snaps onto your laptop in two pieces. SeeThru is precision-engineered to fit perfectly, for a MacBook case that holds secure and removes easily. 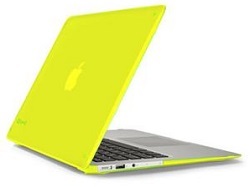 Bright color choices, vent slots on the bottom and anti-tilt rubberized feet enhance your computing experience. Protect your MacBook Air without sacrificing the slim, lightweight look and feel! Ultra-thin (1.2mm) and lightweight two-piece design is easy to snap on and off.